I have been going to Venice for the past eight years and, although I don't spend all of my time in La Serenissima, I have had the privilege of having Italian friends living in Mestre, on the mainland, who take me to places that maybe some of you may have missed. I am not arrogant enough to believe that I have discovered places that the seasoned Venice visitor hasn't seen but I have selected four places or experiences now that just may not be known to you. Forgive me if I preach to the converted. The first is the celebration of the Redentore that takes place on 13th July each year. 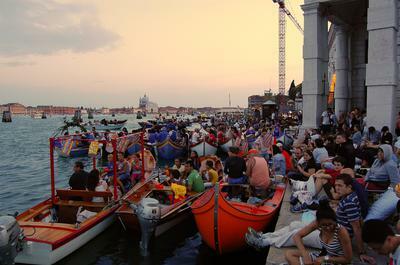 My photo was taken sitting on the quayside outside of Santa Maria della Salute showing the local people gathering for a superb firework display that begins at 11pm. We were there at 6pm to 'bag' a place. The second 'secret' is the beach at Ca'Roman. 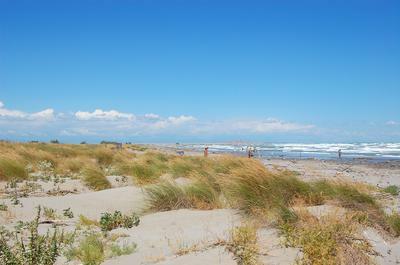 This is a large beach and dune system, one of the largest and best preserved on the northern Adriatic. The beach is reached from Lido di Venezia and, using various bits of transport, including feet, proceeding towards Pellestrina. It is wonderfully wild with no sunbeds, umbrellas in regimented rows, houses, shops or crowds. It also happens to be where one of my embarrassing moments occurred but let's forget that. The third of my choices is the Venice Biennale. For sure many of you will have been but if you haven't, it makes a great day out. It mostly takes place in permanent pavilions in Venice but towards the Lido end. Much of it is challenging/nonsense/amazing - call it what you will but certainly rewarding. My photo shows the Mirror Room that was there when I visited - that's me at the top (or is it the bottom? 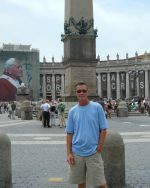 The last of my four choices was found on a chilly day one October right in Venice. 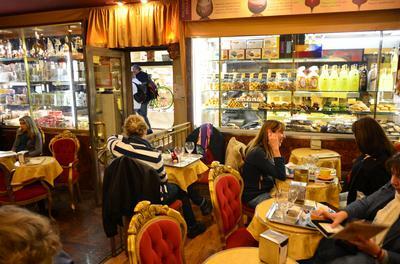 I doubt it is really a secret as such but this was my first time in Cafe Venezia. As you can see, a beautiful and comfortable coffee house where they make the most divine hot chocolate, so thick it was like a meal. I can't tell you where it is but if you are in Venice in chilly weather, do find it and call in. If you give them my name they will have absolutely no idea what you are talking about! Maria's reply: Thank you once again Pete for another excellent contribution - your descriptions are always so evocative and the photos beautiful.